"794 law enforcement officers have fallen in the line of duty since B.H. Obama took office, with no special recognition from the White House." By Louis Jacobson on Tuesday, December 2nd, 2014 at 5:24 p.m.
A reader sent us this meme from social media. Is it accurate? 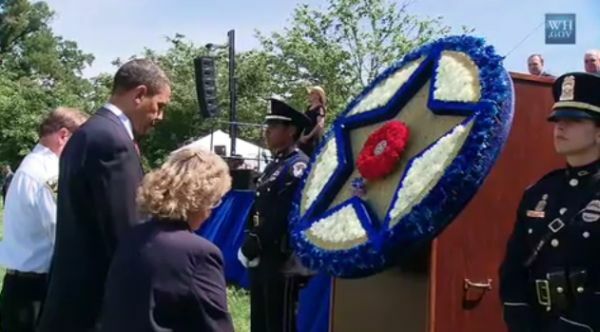 On May 15, 2010, President Barack Obama honored fallen officers at the National Peace Officers' Memorial at the United States Capitol. Recent events in Ferguson, Mo., have inspired waves of anger on social media. Recently, a reader asked us to check one of the memes now circulating on the Internet. The meme pairs two images. One captures several flag-draped coffins, presumably of law enforcement officers. The other is a still from surveillance footage showing Michael Brown allegedly assaulting an employee at a convenience store that he’s suspected of robbing the day he was killed by police officer Darren Wilson. "Want to know where racial tension and cultural divide comes from? "794 law enforcement officers have fallen in the line of duty since B.H. Obama took office, with no special recognition from the White House. "A man robs a convenience store and assaults a cop; the White House sends three representatives to his memorial service." The meme appears to stem from the "Culture Crisis in America" Facebook community, which describes itself as "an e-magazine for Americans subscribing to the notion that the cultural deterioration of American values rests within the root of economic and social crises across our land, and indeed, the globe." Here, we'll focus on the meme's claim that Obama has been indifferent to law enforcement officers killed in the line of duty, giving them "no special recognition." Is that correct? Have 794 officers been killed in the line of duty since Obama was inaugurated? The meme footnotes its figure to the website Officer Down Memorial Page, a privately run page that memorializes and keeps count of the number of police killed in action every year. Between 2009 and Dec. 2, 2014, the site counted 834 deaths. The lower number on the meme probably because the number of deaths has increased since its creator first looked up the number. Due to differences in methodology, the Officer Down Memorial Page figure is somewhat higher than the official federal statistics, which are accessible in an FBI database known as "Law Enforcement Officers Killed and Assaulted." The FBI figures show 521 deaths from 2009 to 2013, roughly half from felonious homicides and half from accidents in the line of duty. If you extrapolate the numbers to include 2014, that would work out to roughly 625 deaths. One footnote: The numbers of fallen officers have been declining rather noticeably in recent years. According to the FBI statistics, the number of officers killed initially rose from 96 in 2009 to 128 in 2010, but then began falling, to 125, then 96 and finally to 76 in 2013. That’s a 41 percent decline in three years. Has there been "no special recognition from the White House" for fallen officers? This is where the meme is entirely off-base. 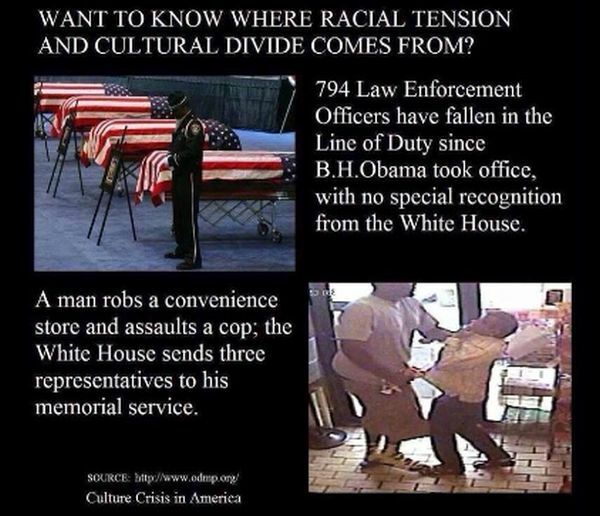 We found many instances of White House "special recognition" for fallen officers. • May 7, 2010: Presidential proclamation for Peace Officers Memorial Day and Police Week. "As a nation, we rely on law enforcement officers to keep our neighborhoods safe, enforce our laws, and respond in times of crisis. These men and women sustain peace and order across America, and we look to them as models of courage and integrity. This week, we honor their extraordinary service and sacrifice, and we remember the fallen heroes whose selfless acts have left behind safer streets and stronger communities." • May 15, 2010: Presidential remarks at the National Peace Officers' Memorial. "To the survivors of fallen law enforcement officers, our hearts go out to you for your loss. The husbands and wives, mothers and fathers you loved, they protected us all. And all Americans are grateful for the lives that they gave in the line of duty." • May 12, 2011: Presidential remarks at a White House Rose Garden ceremony honoring National Association of Police Organizations "Top Cops"
"Tomorrow we know that you and your fellow first responders will be back on your diligent duty -- looking out for us, looking out for one another, looking back at times with fallen partners, determined to make sure that their extraordinary sacrifices were not in vain. And we will be standing behind you, as one nation and one people, proud of your actions, awed by your courage, and grateful for your service on our behalf." • May 15, 2012: Presidential remarks at the National Peace Officers' Memorial Service at the U.S. Capitol. "Today, with heavy hearts, we honor those who gave their lives. .... Their families are in our thoughts and prayers, as we remember the quiet courage of the men and women we have lost. … The rest of us can never fully understand what you go through. But please know that we hold you in our hearts -- not just today, but always. We are forever in your debt. And it is on behalf of all of us, the entire American people, that I offer my thoughts, my prayers, and my thanks. May God shine a light upon the fallen and comfort the mourning. May he protect the peacemakers who protect us every day." • May 15, 2013: Presidential remarks at the National Peace Officers' Memorial Service at the U.S. Capitol. "Scripture tells us, ‘None of us lives to himself, and none of us dies to himself.’ The brave officers we gather to remember today devoted themselves so fully to others -- to serve and to protect others -- that in the process they were willing to give their lives. And so, today, let us not remember them just for how they died, but also for how they lived. … We can never repay our debt to these officers and their families, but we must do what we can, with all that we have, to live our lives in a way that pays tribute to their memory." • May 9, 2014: Presidential proclamation for Peace Officers Memorial Day and Police Week. "During Peace Officers Memorial Day and Police Week, we celebrate those who protect and serve us every minute of every day, and we honor the courageous officers who devoted themselves so fully to others that in the process they laid down their lives. As we mourn the fallen, let us also remember how they lived." The Facebook meme said that "794 law enforcement officers have fallen in the line of duty since B.H. Obama took office, with no special recognition from the White House." While the meme offered a reasonable approximation for the number of fallen officers, the meat of its accusation -- that Obama has ignored the suffering of law enforcement officers killed in action -- is demonstrably wrong. We found at least six instances in which Obama honored the lives of fallen officers in writing or in speeches. Archived information about these events was easily available to the public on the White House website, meaning that the meme’s creator was reckless in not taking them into account. We rate the claim Pants on Fire. Published: Tuesday, December 2nd, 2014 at 5:24 p.m.